Married Name: As of circa 1140,her married name was MacFergus. [S711] Donald Gregory, History of the Western Highlands & Isles of Scotland from A.D. 1493 to A.D. 1625, page 7. [S927] F.S.A., Scot Alexander MacKenzie, History of the MacLeods, page 3. Biography*: His reign was peaceful; but he conducted himself so as to preserve his kingdom from aggression. Olaf was a younger son of Godred Crovan, founder of the Crovan dynasty which ruled the Isle of Man and parts of the Hebrides until the mid 13th century. The ancestry of Godred is uncertain. The Chronicle of Mann describes him in Latin as filius Haraldi nigri de ysland, and it is possible that "ysland" may refer to Iceland. Within the Annals of Tigernach, he is given the Gaelic patronymic mac mic Arailt, which may mean that he was a son, or nephew, of Ivar Haraldsson, King of Dublin (d. 1054). Ivar was a grandson of the celebrated Olaf Cuaran, King of Dublin, King of Northumbria (d. 981), a second generation Uí Ímair dynast. Godred died in 1095, after ruling the Kingdom of the Isles for over 15 years. A period of confusion followed Godred's death before Olaf took control of the kingdom. Part of Olaf's youth was spent at the court of Henry I, King of England. According to the Chronicle of Mann, Olaf reigned for 40 years. The chronicle states that he was a peaceful monarch, and that that "all the kings of Ireland and Scotland as confederates in such a way that no one dared disturb the kingdom of the Isles during his lifetime". Little is known of the ecclesiastical history of the Kingdom of the Isles until Olaf's appointment of Wimund as Bishop of the Isles, in 1134. One of the most important ecclesiastical events in the history of the kingdom was the foundation of Rushen Abbey, in 1134, with a grant of lands from Olaf to the Abbot of Furness. Another key ecclesiastical event was the foundation of the Archbishopric of Nidaros, a metropolitan see centred in Norway. In time this archbishopric, founded in 1152/53, incorporated 11 bishoprics within and outwith Norway. One of these bishoprics encompassed the domain of the Kingdom of the Isles, and was created by a papal decree in 1154. This bishopric mirrored the political reality of the Kingdom of the Isles, due to its similar geographical boundaries and its subjection to Norway; it also further to strengthened the link between the Kingdom of the Isles and Norway. The original grant of Olaf's gave the English Cistercian house of Furness the right to elect a Bishop of the Isles, and several of the early Abbots of Rushen held that position. During the whole of the Scandinavian period the isles remained nominally under the suzerainty of the kings of Norway, but the Norwegians only occasionally asserted it with any vigour. Married Name: As of circa 1130,her married name was MacEth Countess of Ross. Biography*: Godred (Godfrey) was a leader of the Norwegians under Harold Hardrada, King of Norway, at the Battle of Stanford Bridge, where the latter was defeated and slain by Harold, King of England. Escaping from England, Godred seems to have fled to the Isles, where he gradually formed a party strong enough to enable him to expel Fingal from the Isle of Man. But his conquests were not confined to the Isles; he likewise subjugated Dublin, which had for nearly two centuries been the seat of a principality, formed by the Scandinavian Vikings, and a great part of Leinster. He was, besides, very successful in a war against the Scots, whose King, at this time, was Malcolm III, commonly called Malcolm Canmor. Godred Crovan (Old Irish: Gofraid mac meic Arailt, Gofraid Méranech; Guðrøðr; Manx: Gorree Crovan) (died 1095) was a Norse-Gael ruler of Dublin, and King of Mann and the Isles in the second half of the 11th century. Godred's epithet Crovan may mean "white hand" (Middle Irish: crobh bhan). In Manx folklore he is known as King Orry. The notice of Godred's death in the Annals of Tigernach calls him Gofraid mac meic Aralt or Godred, son of Harald's son. As a result, it has been suggested that Godred was a son, or nephew, of the Norse-Gael king Ímar mac Arailt (or Ivar Haraldsson) who ruled Dublin from 1038 to 1046, who was in turn a nephew of Sigtrygg Silkbeard and grandson of Amlaíb Cuarán This would make Godred a dynast of the Uí Ímair. The Chronicles of Mann call Godred the son of Harald the Black of Ysland, variously interpreted as Islay, Ireland or Iceland, and make him a survivor of Harald Hardraade's defeat at the Battle of Stamford Bridge on 25 September 1066. They say that he took refuge with his kinsman Godred Sigtryggsson, then King of Mann and the Isles. Irish annals record that Godred was subject to the Irish King of Dublin, Murchad son of Diarmait mac Maíl na mBó of the Uí Cheinnselaig. Godred Sigtryggsson and Murchad both died in 1070 and the rule of the Isle of Man passed to Godred's son Fingal. The Chronicles say, and Irish sources agree, that Godred then took Dublin although the date is unknown. In 1087 the Annals of Ulster record that "the grandsons of Ragnall" were killed on an expedition to the Isle of Man. In 1094 Godred was driven out of Dublin by Muircheartach Ua Briain. He died the following year, "of pestilence" according the Annals of the Four Masters, on Islay. According to tradition a standing stone at Carragh Bhàn just north of Loch Finlaggan marks his grave. An alternative location for his burial is the Clach Goraidh Crobhan stone near Kintra. Godred left three known sons, Lagmann, Olaf and Harald. Harald was blinded by Lagmann and disappears from the record, but the descendants of Lagmann and Olaf ruled the Kingdom of the Isles until the rise of Somerled and his sons, and ruled the Isle of Man until the end of the kingdom 1265 and its annexation by Alexander III, King of Scots. Even as late as 1275 Godred son of the last King of Mann tried to seize the island. [S711] Donald Gregory, History of the Western Highlands & Isles of Scotland from A.D. 1493 to A.D. 1625, page 6. Biography*: Ethelred (Edelred mac Maíl Coluim or Æþelræd Margotsson) was the son of King Máel Coluim III and his wife Margaret, the third oldest of the latter and the probable sixth oldest of the former. He took his name, almost certainly, from Margaret's great-grandfather King Æþelræd Unræd, or Ethelred the Unready. Edelradus vir venerandae memoriae filius Malcolmi Regis Scotiae, Abbas de Dunkeldense et insuper Comes de Fyf. Margaret was the daughter of the English prince, Edward the Exile and granddaughter of Edmund Ironside, king of England. After the Danish conquest of England in 1016, Canute had the infant Edward exiled to the continent. He was taken first to the court of the Swedish king, Olof Skötkonung, and then to Kiev. As an adult, he travelled to Hungary, where in 1046 he supported Andrew I's successful bid for the throne. The provenance of Margaret's mother, Agatha, is disputed, but Margaret was born in Hungary around 1045. Her brother Edgar the Ætheling and her sister Cristina were also born in Hungary around this time. Margaret grew up in a very religious environment in the Hungarian court. Andrew I of Hungary was known as "Andrew the Catholic" for his extreme aversion to pagans, and great loyalty to Rome, which probably could have induced Margaret to follow a pious life. Still a child, she came to England with the rest of her family when her father, Edward, was recalled in 1057 as a possible successor to her great-uncle, the childless Edward the Confessor. Her father died soon after the family's arrival in England, but Margaret continued to reside at the English court where her brother, Edgar Ætheling, was considered a possible successor to the English throne. When the Confessor died in January 1066, Harold Godwinson was selected as king, Edgar perhaps being considered still too young. After Harold's defeat at the battle of Hastings later that year, Edgar was proclaimed King of England, but when the Normans advanced on London, the Witenagemot presented Edgar to William the Conqueror who took him to Normandy before returning him to England in 1068, when Edgar, Margaret, Cristina and their mother Agatha fled north to Northumbria. According to tradition, the widowed Agatha decided to leave Northumbria with her children and return to the continent. However, a storm drove their ship north to Scotland, where they sought the protection of King Malcolm III. The spot where they are said to have landed is known today as St. Margaret's Hope, near the village of North Queensferry. 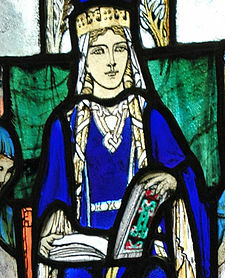 Margaret's arrival in Scotland in 1068, after the failed revolt of the Northumbrian earls, has been heavily romanticized, though Symeon of Durham implied that her first meeting with Malcolm 3rd may not have been until 1070, after William the Conqueror's harrying of the north. Malcolm was probably a widower, and was no doubt attracted by the prospect of marrying one of the few remaining members of the Anglo-Saxon royal family. The marriage of Malcolm and Margaret took place some time before the end of 1070. Malcolm followed it with several invasions of Northumberland, probably in support of the claims of his brother-in-law Edgar. These, however, had little result beyond the devastation of the province. Her husband, Malcolm III, and their eldest son, Edward, were killed in a fight against the English at the Battle of Alnwick on 13 November 1093. Her son Edmund was left with the task of telling his mother of their deaths. Margaret was ill, and she died on 16 November 1093, three days after the deaths of her husband and eldest son. Married Name: Her married name was Godfreysson. Biography*: He was the grandson of Thorfinn Ravenfeeder the Mighty, half-brother to King MacBeth. Haakon Paulsson (Old Norse: Hákon Pálsson) was a Norwegian Jarl (1105–1123) and jointly ruled the Earldom of Orkney together with his cousin Magnus Erlendsson. His father was Paul Thorfinnsson, the son of Thorfinn Sigurdsson and Ingibiorg Finnsdottir. His father and his uncle, Erlend Thorfinnsson, had ruled together as Earls of Orkney. King Magnus III of Norway took possession of the Orkney islands in 1098, deposing both Erlend and Paul. Haakon Paulsson was chosen to become regent on behalf of the Norwegian prince, the future King Sigurd I of Norway, who made Haakon an earl in 1105. According to the Orkneyinga Saga, his cousin Magnus Erlendsson was initially rejected by the Norwegians rulers because of his religious convictions. Magnus was obliged to take refuge in Scotland, but returned to Orkney in 1105 and disputed the succession of Haakon. Having failed to reach an agreement, Magnus sought help from King Eystein II of Norway who granted him the joint earldom of Orkney. Name Variation: Dougal Mac Somerled was also known as Dugall. Biography*: Dubgall mac Somairle (Modern Dubhghall mac Somhairle; Anglicized: "Dugald" or "Dougal, Somerled's son") was a 12th-century Scottish nobleman. The son of Somairle mac Gille Brigte, regulus of Argyll, Dubgall is the eponymous progenitor of Clan MacDougall (Clann Dubhghaill, literally "Children of Dougal" or "Dubgall"). According to the Chronicles of Mann, in 1155 he accompanied his father Somairle in an expedition against Goraidh mac Amhlaibh, King of Mann and the Isles. In 1175, he was one of the Scottish magnates accompanying King William the Lion to York, as William was required to swear fealty to Henry II. In the same year, he and his chaplain Stephan made a pilgrimage to St Cuthbert at Durham, donating two gold rings to the Cathedral Priory. The Chronicles of Mann alleged that the men of the Isles chose Dubgall to be their King, but this may have been a later concoction, and Dubgall is never given a title in any contemporary source. It has been suggested that he was the founder of the bishopric of Argyll, though more likely this took place under his brother Ragnall mac Somairle. [S121] Letter, Blanche MacFarlane to Donald MacFarlane, March 28, 1997.